You are cordially invited to a FACE Pebblesetters Tour on February 15, 2019. This program is entitled George Washington, a Man of Christian Character. This free presentation will be from 10:30-11:45 am in the FACE classroom in Chesapeake Virginia. It will be live streamed for FACE homeschoolers, teachers and parents across the nation. We will begin by presenting a first person dramatic presentation with George and Martha Washington (Dr. Max Lyons and Mrs. Margie Lyons). This presentation includes music, PowerPoint slides, drama, props and costumes. Several students will have speaking parts. There is no need to memorize lines as they will read their lines. At the end of the presentation we will introduce and discuss Washington’s Rules of Civility. The full title is Rules of Civility and Decent Behavior which is 110 character rules of conduct that Washington read, copied, memorized and used to develop his stellar Christian character. We will spend a few minutes beginning a relating exercise by having the students think about and write down several of the rules that are especially important or meaningful to them. This relating and writing assignment will need to be completed at a later time by the teacher. For the last 15 minutes we will take a tour of the Hall-Slater Library. This research library holds over 10,000 volumes related to America’s Founding era, including writings of the Founders, colonial pastors, and men studied by our Founders. There are many rare books in this collection and we will examine books related to Washington and his time period. Interestingly, this is always the favorite part of coming to FACE for the students. They are always fascinated by it!The Foundation for American Christian Education presents: George Washington, A Man of Christian Character live in our Chesapeake classroom and live online on Friday, February 15, 2019. 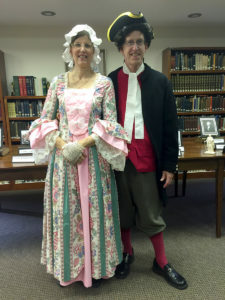 This is a free 75 minute presentation for upper elementary aged children featuring: a dramatic first person presentation by George and Martha Washington, music, visuals, student participation and “relating” activity with Washington’s Rules of Civility. Join us on campus or via livestream 10:30 -11:45 am, EST. This event is FREE. For more information, e-mail Max Lyons or call 757-488-6601.